The Centerpiece of an Easy and Delicious Buffet! Moist and tender ham and turkey make up this new kit. 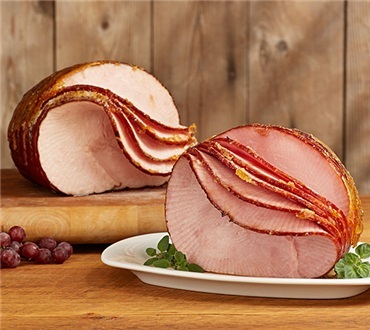 The spiral-sliced, maple-glazed ham delivers a slightly smoky signature ham flavor. This combination also offers lean and tender turkey for those who prefer poultry. An easy option for party hosts, serve at room temperature or warm to your taste. I have been buying this combo for years and love it. The ham and turkey are added to my Holiday Open House table along with charcuteries, smoked salmon, and various hors d'oeuvres. A Mashtini bar adds some fun as well. We purchase the combo every year, at least once. Our guests always look forward to it being an essential part of our Christmas/New Year party. Love it. We lived in Vermont and always came to the store to pick up ham, turkey, chesses and meats, and gifts for friends. Now we are in Arizona and order them at least once a year. Thank you for the consistency in all your products over the years. We love Dakin Farms! The meats were very good and flavorful. They were sliced too thick for my liking, especially for sandwiches. I would like to be able to specify slice thickness when ordering.